Disney Live! presents a spectacular staging of Mickey's Music Festival at the Kia Theatre in Cubao, Quezon City on September 1-6, 2015. Watch Mickey, Minnie, Donald and Goofy; Ariel, Sebastian and Ursula; Jasmine, Aladdin and Genie; and Woody, Buzz and Jessie sing and dance to famous Disney hits remixed to hip hop, pop, swing, reggae, rock, country, and more! This will be an unforgettable episode for children and a sure nostalgic moment for adults. Disney Live! Mickey's Music Festival will bring to the stage more than 25 Disney stars we all grew up and love. "Disney live is the first live show experience many children will have so what I want them to walk away with is an experience that they won’t forget. I want them to have the best time with their parents with their siblings dancing singing and seeing their favorite characters come to life," said Feld Entertainment Producer Alana Feld. In order to create a total rock and roll experience, Feld Entertainment has hired the best creative minds on board, bringing in the hippest director Fred Tallaksen who has worked with Madonna, Enrique Iglesias, and a bunch of other artists. Tallaksen applauds the whole production and creative team especially the versatility of performers. "One of the challenges for the cast is they have to play different parts in the show. They have to be able to tumble, there is rollerblading, there is drumming, there’s all these things in the show and a lot of the performers do all of them." “This has got to sound different from any show we’ve ever done because we’re really going to this rock festival concert. It’s a rhythm-driven track with everything being contemporary sounding,” shared Music Director Stan Beard. Disney Live! 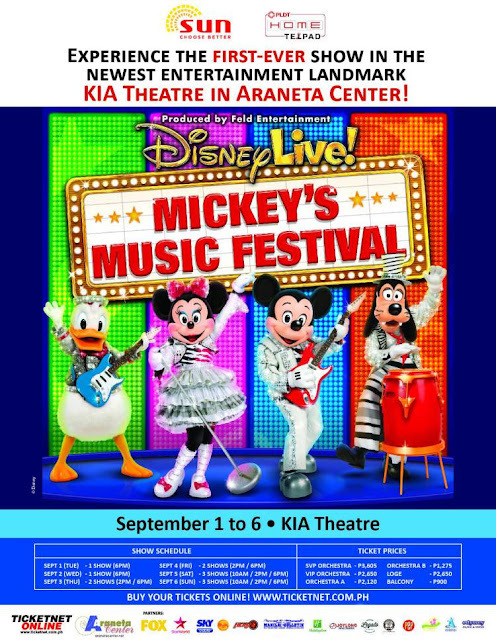 Mickey's Music Festival is the first-ever show of Kia Theatre, formerly New Frontier Theater, which runs from September 1 to 6, 2015. Tickets are now available. Order your tickets online or call 911-5555 for more details.